Scot Heating Company had a good representation at the Annual WHA conference held over the 28th and 29th of November at the Edinburgh Zoo. Thanks to all attendees, suppliers, professionals & especially the Organisers for making it an interesting & enjoyable event. Haas Tyron 2000 XL – Double Shaft Slow Speed Shredder. New Edition 2.0 The Haas Tyron shreds difficult materials such as: Wood waste Pallets Railway sleepers Domestic, industrial & bulky waste Cable drums Tyres Paper towels Green waste Mattresses Roots Aluminium Food waste. Ensuring our vehicles are equipped with the latest safety technology is important. Copy to come for this story. 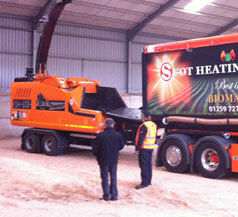 Scot Heating Company MD, Malcolm Snowie, is interviewed for The Herald’s SME Focus feature.